Green-up Transitioning to Growth: Ready to Mow? Three weeks ago, many turfgrasses began greening up as surface soil temperatures warmed into the 50s °F during the day. Currently, surface soil temperatures are reaching into the 60s °F during the day, which stimulates vertical leaf growth especially after a rain. Any early spring N fertilization will also encourage vertical leaf growth. Accordingly, mowing equipment should be reconditioned and ready for routine use. Setup of mowing height should not be overlooked; an incorrect mowing height will lead to problems. Generally, lawn grasses will be easier to maintained at a mowing height of 3-inches or higher. Grasses will be healthier when there are more leaves (leaf area) to capture sunlight for photosynthesis and shade the soil surface. More photosynthesis helps the grass grow more roots and a shaded soil surface remains cooler. Shade also blocks the exposure of weed seed to light, which is an environmental trigger for weed germination. Uneven ground is another reason to recommend relatively high mowing. Many lawns are relatively uneven. A lack of smoothness in a lawn contributes to poor mowing. A mower set 3-inches helps protect high spots in a lawn from being severely scalped. For example, a high spot in a lawn that ends up being cut at 2-inches with a mower set at 3-inches would be cut at 1-inch if the mower were set at 2-inches. Mower scalp caused by mower deck being set too low on a lawn with uneven ground. Roughstalk bluegrass (Poa trivialis) is a cool-season perennial grass often considered a weed. Light green in color it is most obvious in the early spring when it grows more rapidly than other turfgrasses. As temperatures rise in the summer its growth will slow and it often goes semi-dormant until cooler temperatures and rainfall return in the autumn. A roughstalk bluegrass plant in a lawn in spring. A small roughstalk bluegrass plant with purple stems. Infestations usually begin as small plants, but over time these plants spread via stolons and form patches that don’t tend to mix well with other cool-season grasses. These patches form as small plants expand from stoloniferous growth. 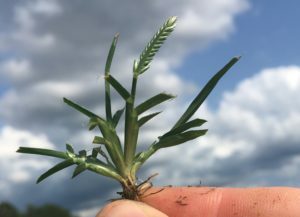 These stolons (in addition to the lighter green color) can be used to differentiate roughstalk bluegrass from other bluegrasses such as annual bluegrass (no stolons or rhizomes) and Kentucky bluegrass (rhizomes only). 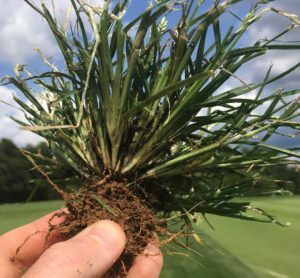 Unlike Kentucky bluegrass, roughstalk bluegrass also has a long membranous ligule with a pointed tip. Patch of roughstalk bluegrass in a lawn. Currently there are no selective herbicides you can use in a home lawn to control roughstalk bluegrass. For many years Velocity herbicide was an option for professional turf managers, but it is no longer being manufactured and is not registered for use in home lawns (golf courses and sod farms only). Xonerate herbicide can provide some suppression, but should be used carefully to prevent injury to desirable turfgrass. To control roughstalk bluegrass in cool-season lawns and athletic fields, nonselective control with glyphosate (Roundup and others) followed by reseeding is the best option. Apply glyphosate at this time in early spring, before summer stress, for best control. Glyphosate will kill any plant the spray contacts so apply carefully. If the areas are small, consider removing them with a shovel or a sod cutter. Be sure to remove the patch and at least 12 inches of turf surrounding the patch. Removing soil to a 0.5-inch depth should be sufficient to remove the stolons and all growing points. Reseed or sod the area with a desirable turfgrass species after removal. These recommendations are based off of the 2019 Turfgrass Weed Control for Professionals guide. I highly recommend this guide for professionals managing cool-season turfgrass. The recent warm weather means its time to started on lawn and landscape projects. 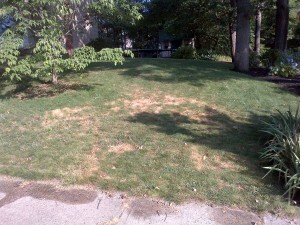 You may have plans to seed bare spots in the lawn that you didn’t get to in the autumn. 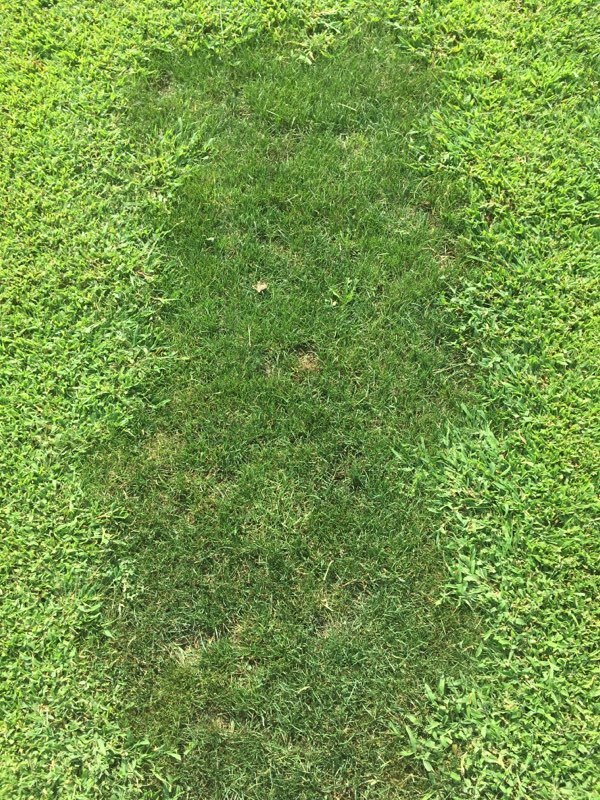 These bare spots may be the result of fungal diseases, which were aplenty due to heavy rainfall in 2018. Summer annual weeds such as crabgrass or Japanese stiltgrass can out compete desirable species in the summertime and leave bare areas as well. While autumn is the ideal time to seed lawns in New Jersey, spring seedings can be successful if you have a plan to control summer annual weeds. Weed competition from summer annual weeds is much more intense and is the main reason spring seedings are unsuccessful. In a mature lawn, you can apply a pre-emergence herbicide (crabgrass preventer) to manage weeds such as crabgrass and stiltgrass. If you recently seeded or have plans to, these crabgrass preventers are not an option. If you are planning to seed this spring, using a starter fertilizer product that also contains the active ingredient mesotrione is an effective option when applied at seeding. It will control weed seedlings as they emerge without harming the grass you’ve seeded. One product for home lawns that contains mesotrione is Scotts® Turf Builder® Starter® Food for New Grass Plus Weed Preventer. Mesotrione is available for professional applicators as Tenacity® and other trade names. Products that contain siduron (Tupersan) are also an option for crabgrass control at seeding. Mesotrione and tupersan are not as effective as other pre-emergent herbicides such as pendimethalin, dithiopyr, and prodiamine that can be used on mature, well-established lawns. After mesotrione is applied, weed seedlings and sometimes the turfgrass will appear bleached for 7 to 21 days after the application. The turfgrass will recover but most of the weed seedlings will not. Read the label carefully especially when using mesotrione and seeding fine fescue. Do not over apply mesotrione as it can damage grass you’ve seeded, especially perennial ryegrass. In areas of heavy weed pressure, mesotrione and siduron will likely not provide season-long crabgrass control. A second mesotrione application can be made 4-6 weeks after the initial or post-emergence herbicides that conitain quinclorac or fenoxaprop are also options if crabgrass develops mid-summer. Sprayable products sold for crabgrass control usually contain quinclorac or fenoxaprop. 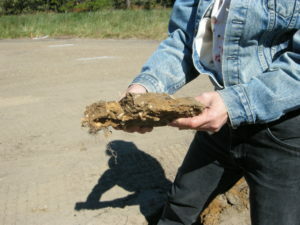 Soil that has been severely compacted often breaks into large massive plates. For those interested in soil health – we all should be – the Soil Health Institute has release a 60-minute documentary featuring innovative farmers and soil health experts from throughout the U.S. The summer of 2018 isn’t going away quietly for many in New Jersey. August 2018 will be remembered for a steady dose of torrential rain that has made turfgrass management extremely difficult, especially in the northern half of the state. 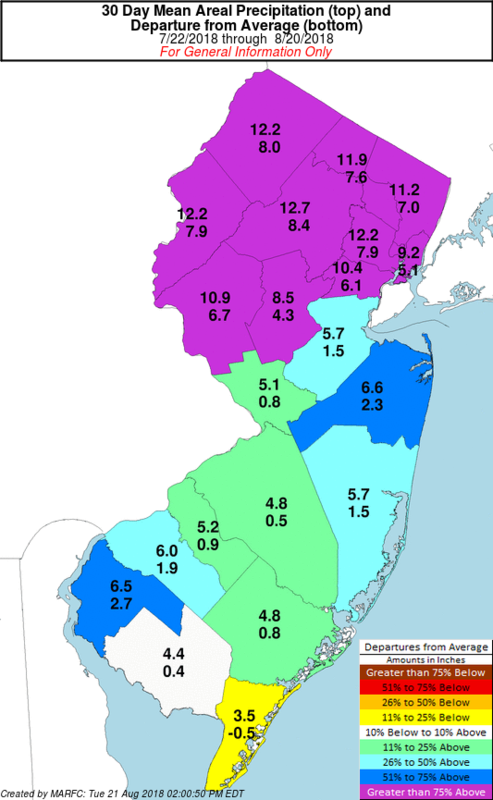 In the last 30 days, over 12 inches of rain have fallen across several counties in Northern NJ. This is almost triple the 30-year average of approximately 4 inches of rain for this period in a normal year. Map generated by the national weather service. 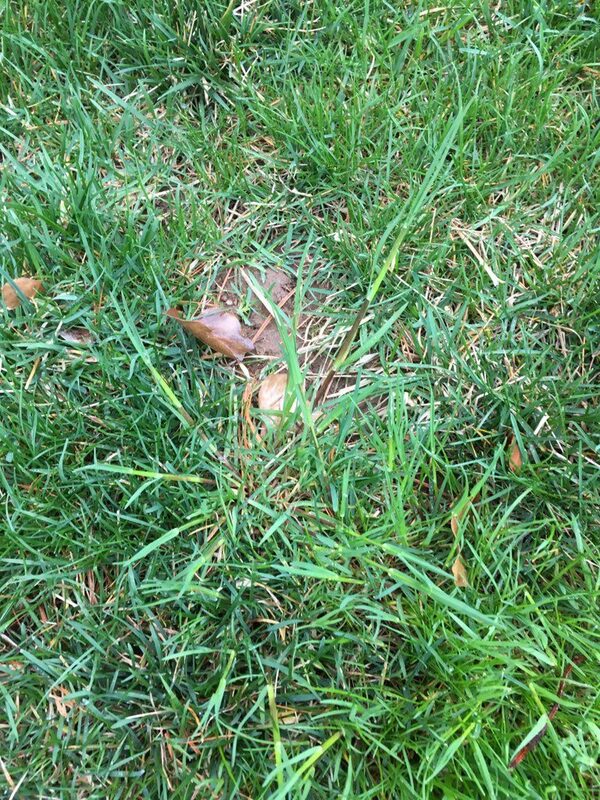 These rains have produced saturated soils during an already difficult time of year for cool-season turfgrass (examined by Dr. Murphy in a previous post). High humidity and extended periods of leaf wetness have provided ideal conditions for diseases as well. 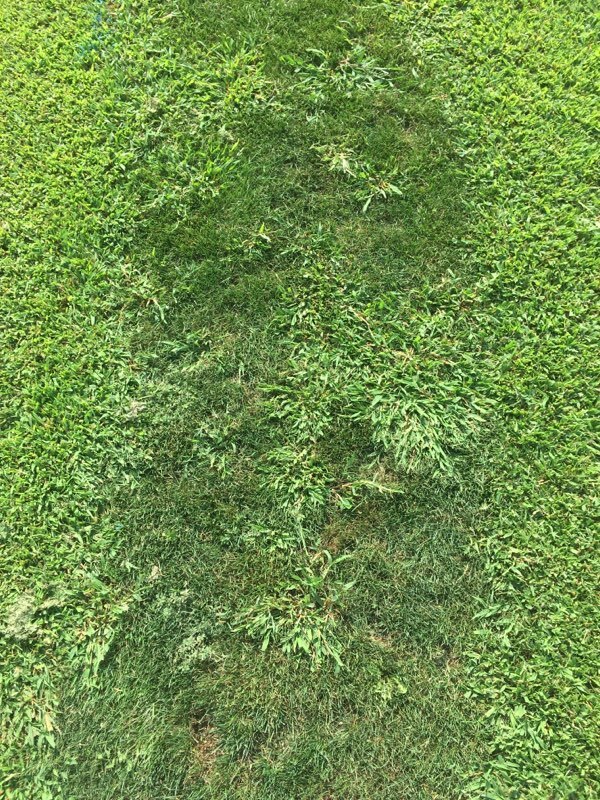 Desirable turfgrass is thinning out and giving the competitive advantage to certain weeds. If you have weed problems right now you are not alone! Nutsedge, false-green kyllinga, and creeping bentgrass (where it is a weed in poorly drained areas) are very competitive perennial weeds in wet soils and I’ve noticed they have become more prevalent in recent weeks. Even roughstalk bluegrass has awoken from summer dormancy in some spots. Amongst annual weeds, crabgrass and goosegrass seem to be especially prevalent this year. Plants that escaped pre-emergence applications matured very rapidly through warm and wet conditions in late July through mid August and made post-emergence control difficult. Crabgrass and goosegrass are much more difficult to control as they mature beyond the 5-7 tiller stage of growth. With heavy rainfall and warm temperatures in late July it was difficult if not impossible to make post-emergence applications in time for optimal weed control. Goosegrass plant with 4 tillers. Difficult, but not impossible to control. Goosegrass plant with too many tillers to count. Extremely difficult to selectively control. In a perfect world, post-emergence herbicide applications are not necessary due to an effective pre-emergence herbicide program. But grass, soils, and weather are not perfect and pre-emergence breakthrough in problem areas is expected. Pre-emergence herbicide programs were pushed to, or past the limit after heavy rainfall this spring. Late May was especially wet in the Central NJ where some areas received almost 10 inches of rain which fell during 11 days of a 17-day period (see CoCoRaHS for statewide maps). These conditions may have increased dissipation of pre-emergence herbicides, especially in sandy soils. Crabgrass breakthrough may be especially evident on slopes, high traffic areas, compacted soils, or where only a single pre-emergence application was made. Research consistently demonstrates that split application pre-emergence programs provide better crabgrass control than a single application and we are seeing history repeat itself in our 2018 crabgrass trials. Split application programs are providing excellent crabgrass control, and two most common pre-emergence herbicides (dithiopyr and prodiamine) are providing the same amount of crabgrass control at both locations. Keep in mind that in our research trials we subject herbicides to intense weed pressure, but the herbicides are applied uniformly under ideal conditions (immediate post-application irrigation, clipping return, non-compact soils) so we can make comparisons amongst treatments. Real world conditions may not be so ideal. Excellent crabgrass control from a pre-emergence herbicide applied in early April and re-applied mid-June. Notice crabgrass pressure in the non-treated areas around the plot. Less crabgrass control from a single application of a pre-emergence herbicide in April. In total for the season, the same amount of product was applied to both plots pictured. Apply post-emergence herbicides if possible. Weed suppression that limits seed production is especially worthwhile on and around high-value sites (e.g., putting greens, athletic fields). 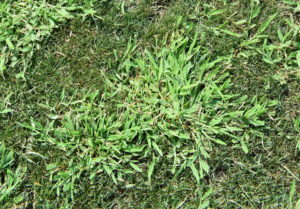 Pylex (topramezone) is an excellent option for goosegrass control and crabgrass suppression in cool-season turfgrass. In my experience, applications at 1.0 to 1.5 fl oz/A will control multi-tiller plants (only 0.25 oz/A is permitted in creeping bentgrass). Tank-mixtures of Pylex and SpeedZone also provided excellent goosegrass control in our 2018 research. This tank-mixture will be evaluated more in 2019 as an option in Kentucky bluegrass, perennial ryegrass, and tall fescue. Quinclorac products (Drive XLR8, Solitare, generics) that can be applied at up to 0.75 lbs quinclorac/A are more effective than Pylex on crabgrass in cool-season turfgrass (lower rates can be used in creeping bentgrass) but will not control goosegrass. Tank-mixtures of Drive XLR8 and Pylex are safe to Kentucky bluegrass, tall fescue, and perennial ryegrass in my experience. Acclaim Extra (fenoxaprop) is another good option that will provide multi-tiller crabgrass and goosegrass control at higher rates. See product labels for more information on turfgrass tolerance, tank-mixtures, and weed control efficacy. Be sure to read the label carefully for information on adjuvants. Not including an adjuvant, or using the wrong one will severely reduce the efficacy of many post-emergence herbicides. For even more information, an excellent guide for weed ID and herbicide selection can be found here at the Purdue University Bookstore. I highly recommend this comprehensive guide. More importantly, use fertilization and cultural practices to encourage recovery of the cool-season turfgrass once temperatures are more favorable and cool-season grasses regain the competitive advantage (hopefully around labor day). 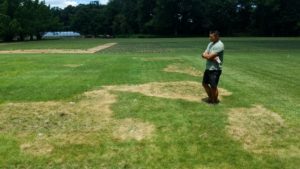 A strong stand of turfgrass will be more competitive against winter annual weeds and crabgrass in 2019. 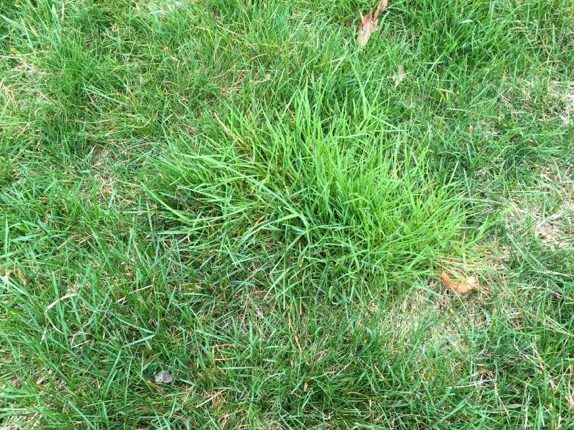 Even in cases of severe crabgrass or goosegrass infestation, a total kill of the existing turfgrass stand is usually not necessary if there is a good base of desirable turfgrass lurking beneath the crabgrass. Use selective herbicides, seed, cultural practices, fertilizer, and September weather to your advantage. Cool-season lawn struggling to grow in shallow soil on a south-facing slope during dog days. According to Merriam-Webster, dog days is the period between early July and early September when the hot sultry weather of summer usually occurs in the northern hemisphere; a period of stagnation or inactivity. You most likely have noticed that cool-season grasses have recently entered a period of stagnation or inactivity (dog days) and, in some cases, are spent. The hot summer days have steadily increased soil temperatures to the point that the soil is now warmer than air temperature for much of the daylight hours and all of the night. During the last 10 days at Hort Farm No. 2, soil temperature at 3-inches has oscillated between 76 and 90 °F and at 2-inches 78 and 92 °F. These soil temperatures are well above the optimum temperatures for root growth and clearly explain why cool-season grasses are lethargic at this time. What to do? Be patient and do not “push” the grass. This is not the time of year to stress out turf – the grass has very little resiliency and will not tolerate much abuse or recovery quickly. 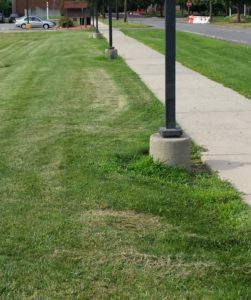 I recently witnessed utility vehicle traffic on subtly drought stressed turf during the hottest part of the day result in classic tire-track damage. Root systems of cool-season grasses are weakest and shallowest at this time of year. Thus, localized drought stress can develop rapidly – within a couple hot, sunny days – during the dog days. These cultural practices can be helpful in getting high value turf to survive dog days. Once the turf has drained after drenching thunderstorms (2-3 days), program daily, very-light (50-65% of reference ET), deficit irrigation using a rainhold setting (such as 0.2-inch rain) to stop irrigation from adding to over-wetting from storms. Deficit irrigation assures that thunderstorms will be the reason for excess wetness, not the irrigation schedule. This irrigation plan should encourage the turf the dry without over-drying between irrigations (or thunderstorms). If excess drying does occur with this irrigation plan, it probably will start in highly localized (small) areas, which can be effectively managed with well-timed syringing to re-hydrate dry leaves and prevent crispy thatch during the heat of the day. Crispy thatch means that surface adventitious roots either are or will soon be crispy as well. Moist to dry thatch is good, whereas crispy and crunchy thatch in the heat is bad. Weekly, low-rate fertilization (N and possibly P, K and micronutrients) is crucial on sand-topdressed and sand-based rootzones commonly found on golf course putting greens and some sports turfs. These rootzones have very little mineralization capacity to supply essential nutrients during dog days. Weekly low-rate fertilization provides a steady, consistent slow-growth and avoids the “surge-crash” cycle of growth that results from less-frequent and higher application rates. Typically, low-rate N is no more than a 0.1-lbs. per 1,000-sq. ft. Hot weather in early July brought on some severe summer patch (root disease) symptoms in hard fescue. This disease on fine fescues hasn’t been as thoroughly studied as it has been on other grasses. So recommendations are based on knowledge learned in Kentucky bluegrass (Poa pratensis) and annual bluegrass (Poa annua) turfs. We are establishing plots this summer and fall to learn more about this disease on hard fescue. 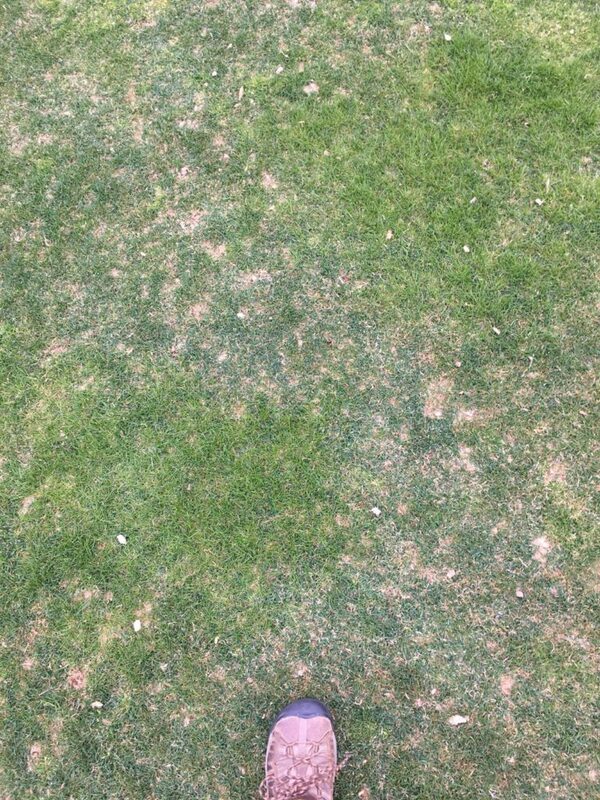 Symptoms of summer patch disease on a 4-year-old hard fescue turf in New Brunswick NJ. Fine fescues are better adapted to dry and infertile soils. Summer performance of fine fescue will generally be better in moderate to light shade than full sun. To limit damage from summer patch on fine fescues, do not apply more than 2 lbs. of N per 1,000 sq. ft. per year. An acidifying form of N such as ammonium sulfate is thought to be the best choice when fertilizing fine fescues affected by summer patch. Caution is needed when irrigation fine fescue turf, especially on heavy (loamy) soils. Summer patch disease tends to be more severe on soil that retains water. Irrigation should be applied in a manner that moistens the soil after some time of drying but does not keep the soil excessively wet for many days. Mow fine fescue turf no lower than 2.5 to 3 inches and stop mowing when the turf shows symptoms of heat and drought stress in the summer. Fine fescue turf grows more slowly than other cool-season turfgrasses especially when air temperatures approach and exceed 90 °F. See Dr. Bruce Clarke’s PowerPoint slides for more details on summer patch disease. Recently received a couple of questions about managing thatch. One question was concerning the recent trend in the industry to not core putting greens and only use solid tines. It feels like winter is hanging on and it looks a bit more Siberia-like than it did at this time in 2017. I’m writing this while watching the telecast of the Arnold Palmer Invitational in sunny Florida (where the greens are rolling PURE) and another snowstorm is taking aim at the Northeast. Interestingly, when comparing the 2018 GDD accumulation to 2017, things aren’t too different. We have accumulated about 300 GDD (using a base of 32 F) to date compared to 340 GDD at this time in 2017 in central New Jersey. However, things do look different when using a GDD model with a base of 50 F. We have accumulated 26 GDD50 to date in 2018 compared to 58 GDD50 at this time in 2017. Soil temperatures (3 inch depth) hit 50 F for a couple days in February, but have been hovering between 35 and 40 F ever since. So what does that mean for weed control? Our 2016-2017 seedhead suppression research (in collaboration with Dr. Zane Raudenbush at OSU-ATI) demonstrated that Proxy applied in December and twice in the spring provided better annual bluegrass seedhead suppression than two spring applications. Interestingly, a single Proxy application in December with no spring applications was very effective in both New Jersey and Ohio. We are currently repeating this research. I’ve been asked if Proxy applications in January or February instead of December would be effective. 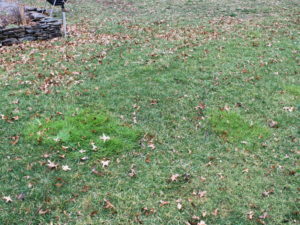 Dr. Shawn Askew’s research in the Mid-Atlantic region demonstrates that January or February applications are extremely effective, but this application timing has not been evaluated in the Northeast or Midwest where annual bluegrass tends to be more dormant in January and February than in the Mid-Atlantic. This concept is something we plan to explore in more detail next winter. The forsythia bush is an effective phenological indicator of crabgrass germination. When forsythia reaches full bloom, it is an indicator that the opportunity to apply crabgrass pre-emergent materials is about to pass. If you are using dithiopyr (Dimension) you can wait until shortly after crabgrass emergence to apply. You may remember last year that in Central and Southern New Jersey, forsythia bloom began in early March and these early blooms were killed by a snowstorm. Forsythia full bloom occurred in early April 2017 (and crabgrass germinated in mid April), which was a bit earlier than normal. This year with more seasonal temperatures, buds are visible but we are still several warm days away from forsythia full bloom. We are also well below the 3-day 55 F soil temperature threshold that is another good indicator of crabgrass germination. The 5-day rolling soil temperature average has been below 38 F for the last week. 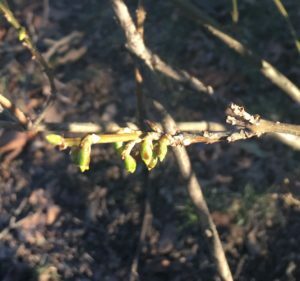 Forsythia buds in Central NJ on March 18. With this seemingly long winter you may be stir crazy or trying to find something to do besides clean up tree debris. In regards to weed management, be patient and make applications when the plants are ready. The soil is slowly warming and the sun intensity is increasing as we trudge towards spring. In the meantime, make sure your sprayer is calibrated and get the dust off your golf clubs. Spring is coming – allegedly.